Tomorrow is World Wide Knit in Public Day for 2018 and will be celebrated world wide! Bring your project - knit, crochet, weave or craft with us! 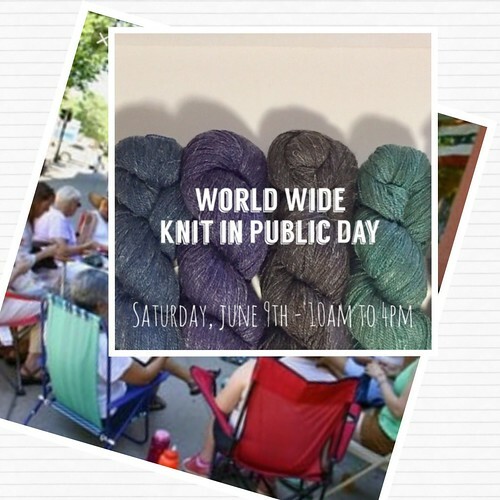 This Saturday we will be hosting World Wide Knit in Public Day from 10am until 4pm. World Wide Knit in Public Day was started in 2005 by Danielle Landes. It began as a way for knitters to come together and enjoy each other’s company. 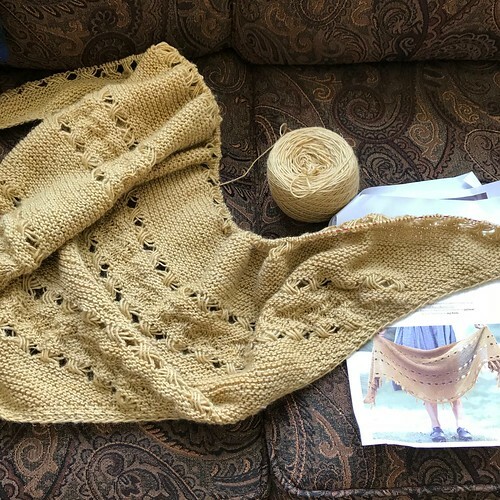 Knitting is such a solitary act that it’s easy to knit alone somewhere and sink into your work without thinking about all the other knitters out there. Neighbors could spend all their lives never knowing that the other knits. This a specific day to get out of your house and go to a local event (with your knitting in tow) just for you and people like you. Who knows you might even bump into your neighbor! Consider this a spark, to ignite a fire; getting all of the closeted knitters out into fresh air. Any project to work on. I do have folding chairs but you can bring your own, sunglasses, sunscreen and water. I will have coffee, tea, water and some goodies but it has been decided that this will be a potluck so bring something to share and we'll have a party! Nicole is bringing cake, Linda is bringing a veggie platter, I will have Spanakopitas and mini quiches! 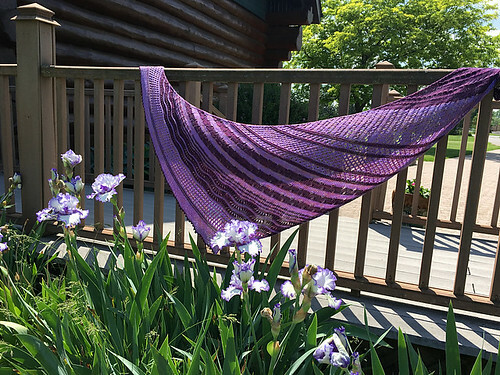 Malana by Kelly Menzies will be free only for the month of June so favorite it and download it now! 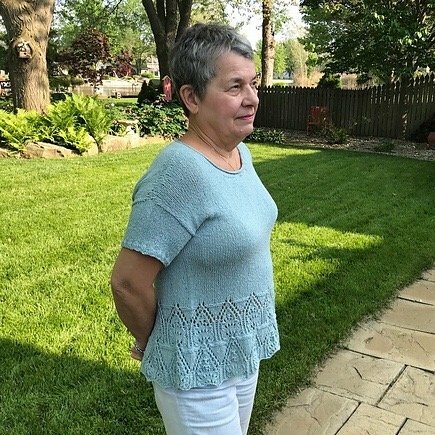 Knit it with a DK weight yarn for a summer top that will love to wear. 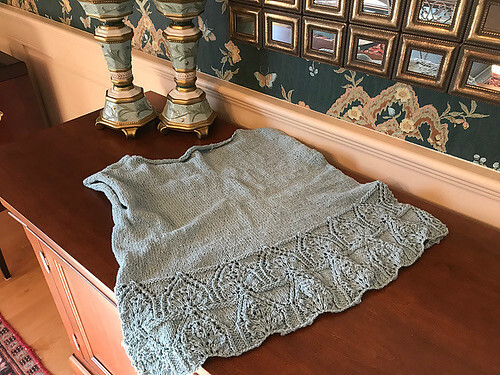 It has a gauge of 18 stitches and 40 rows = 4 inches in garter stitch using a 4.5 mm (US 7) needles. 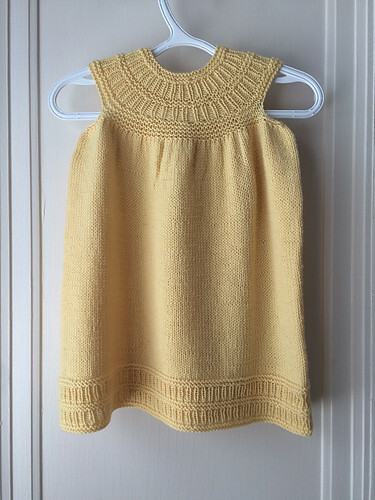 Knit it with or without sleeves in summer yarn such as cotton, linen or blend such as Bergere de France Ecoton, Berroco Remix Light or Berroco Mixer. 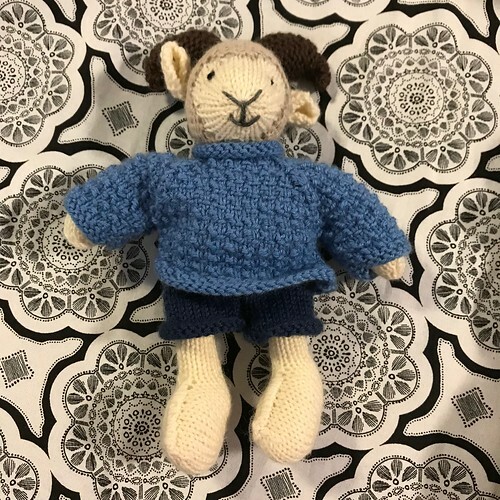 Is there a baby to knit for? These Baby Moccasins by Purl Soho are so adorable!! The description from the pattern says "These super easy baby booties are such a breeze to knit that a set of three would be a perfect gift. I would love if people used this pattern as a starting point to make booties unique to their own inspirations. Change the colors and duplicate stitch designs to make a set of Christmas booties, Jungle booties, Flower Garden booties, Art Deco booties, Pirate booties - the list is endless! 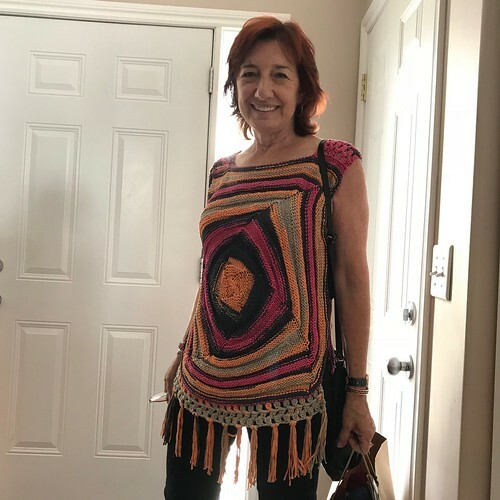 Whether you stick with our Native American inspired moccasins or come up with your own theme, it would be really fun to see the fruits of your labors - please share your links!" 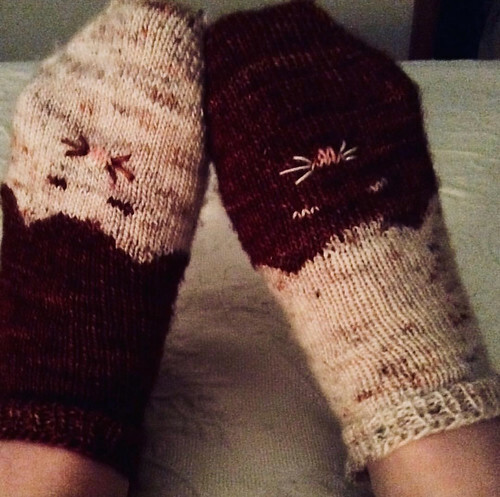 They are knit with a sport weight yarn using 2.75 mm (US 2) and 3.5 mm (US 4) needles for a gauge of 6 stitches = 1 inch in stockinette stitch with larger needle. 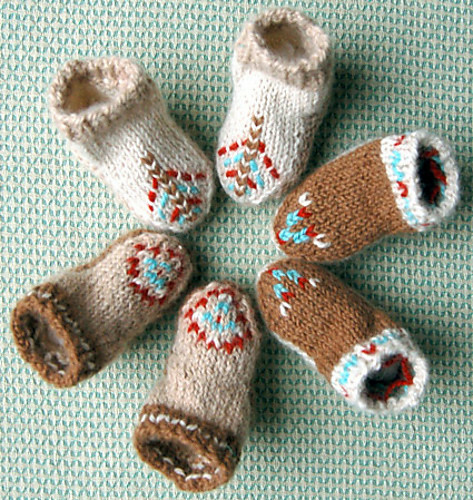 The finished booties will fit an infant and measure 3.5 inches from the heel to the toe. The Hipster Shawl by Joji Locatelli that is on my needles is getting close to being finished. I am knitting mine with Manos Milo, a wool/linen blend in the Savana colourway. This was my my progress oon Wednesday afternoon when I snuck in some knitting out on my deck. Argggh!! 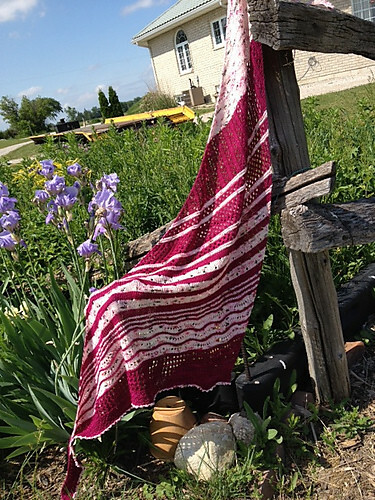 I got to almost the end of the row (3 rows from the end) and I am short 2 triple wraps to finish the last set of the indian cross pattern! I was at the same place Wednesday night, frogged and re-knit the rows just thinking I had only missed something...But here I am again ad it turns out that I missed 2 kfb's 2 rows back! I should note that I used the same needles throughout and just before this last indian cross row, I came across sushoch's Hipster notes where she "realized the huge advantage of using interchangeables. 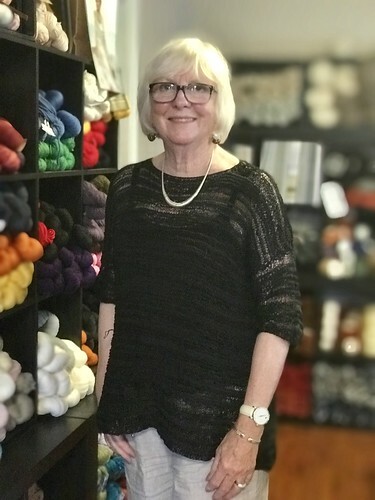 For the one row where I was sliding the YOs down my needle I attached my smallest needle on the left hand needle so the stictches could easily slide off and then switch out the needle when the row is complete." What a great tip! The current Knit-Along is an Any Project Knit-Along! Knit Your Any Project KAL: An everlasting knit-along to encourage and support you to knit your own project (any project, and join in anytime! ), from April 1 to June 30, 2018. June in - the next draw will take place July 1, 2018! 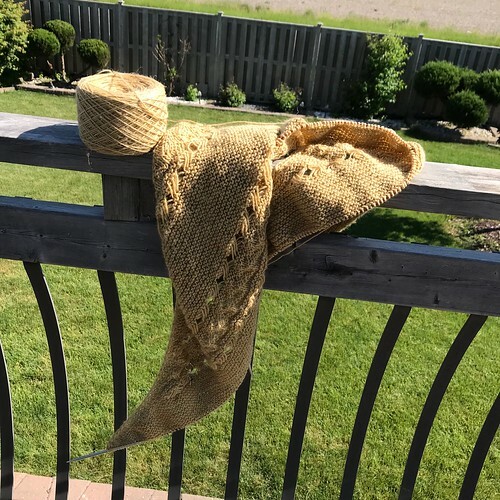 You don't have to come to a Knit Afternoon or Knit Night to be included in the draw but you do need to post your finished projects to the Group Finished Objects thread on Ravelry. 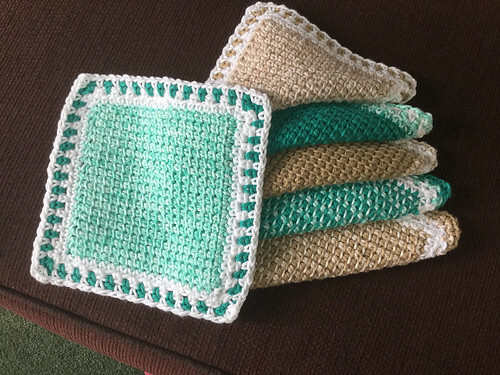 Reminder - many of the finished projects that I have been posting have NOT been posted to the Finished Objects thread! 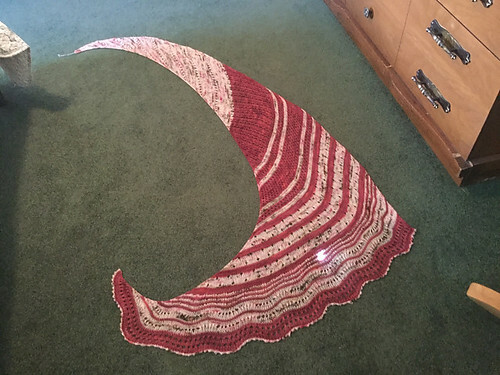 Connie (knitnut246)’s Tegna while on needles. Her finished is today’s cover shot!